Mobile phones have become an integral part of our daily activities. The use of mobile phones started in the early eighties, and since then it has increased exponentially. In 2014, the World Health Organization estimated 6.9 billion users of mobile phones globally. India is considered the second largest market for smartphones and is expected to have 650 million users of smartphones by 2019. With the advancement of technology, the role of mobile phones is not limited to only making or receiving calls. Present day smartphones support a wide range of services such as text messaging, internet access, short-range wireless communications (infrared, Bluetooth), business applications, gaming, and photography. Research has shown that approximately 40%–55% of the radiofrequency output from mobile phones is absorbed in the user's head. International Agency for Research on Cancer classified mobile phone radiation as a possible carcinogenic to humans. Adverse effects of mobile phone use on health include the possible link to increased risk of vehicular accidents, leukemias, sleep disturbances, and brain tumors. The thermal effects of electromagnetic radiation (EMR) include headache, sensation of warmth or burning around the ear, burning sensation on the facial skin and alteration of the blood–brain barrier. The aims and objective of the study was to study the effect of mobile phone on average pure tone audiometry (PTA) threshold of the person and to study the changes in the pure tone threshold at high frequencies such as 2 kHz, 4 kHz, and 8 kHz among the students with prolonged exposure to mobile phones. The study was carried out at the Department of ENT of the institute. Clearance was obtained from the Institutional Ethics Committee before starting the study. The study population comprised the medical students of the institute within the age group of 18–30 years and who were using mobile phones for the past 5 years or more. Individuals not willing to consent for the study, individuals with preexisting ear disorders, history of sudden loud noise or chronic noise exposure, using headphones for recreational purpose for more than 1 h/day or individuals with any systemic diseases such as diabetes, hypertension were also excluded. Individuals with a history of taking ototoxic medications in the past, those with a history of measles, mumps, rubella, jaundice, etc., were also excluded. Those with a history of alcohol abuse were also excluded from the study. The students were first screened randomly with a predesigned and pretested questionnaire, and a thorough clinical examination was carried out. Duration of use of mobile phones for making and receiving calls was cross-examined by taking into consideration the average duration of call log for randomly selected 2 days in the preceding week. This was based on the findings of the study by Ahn et al. which shows that contrary to popular prediction the difference in usage pattern of mobile phones between weekdays and weekend is small. The selected candidates were subjected to impedance audiometry to rule out any middle ear pathology. PTA was then performed for both air conduction (AC) and bone conduction (BC) as per American Speech-Language-Hearing Association guidelines  and the thresholds at various frequencies noted. The average pure tone threshold for AC and BC were calculated by taking the average of the hearing threshold at 500 Hz, 1000 Hz, and 2000 Hz. It has been observed in a study by Seidman et al. that handedness of individual determines the pattern of use of mobile phones. In the same study, it was seen that 68% of right-handed persons used their mobile phones in the right ear while only 25% used in the opposite ear while 7% had no preference. As such in most scenario, one ear is predominantly exposed to mobile phones as compared to the other ear. The dominant ear (the ear predominantly used while making or receiving a call) was considered the exposed ear and the other ear (nondominant ear) was considered the nonexposed ear. Individuals who had no preference and had both ears exposed during call were excluded. A cutoff duration of usage of mobile phones for more than or equal to 2 h/day was taken for comparison of the threshold of hearing between the exposed ear and the nonexposed ear. Statistical analysis was carried out using SPSS version 16 (Chicago, SPSS Inc.). Among users of mobiles for the duration of more than or equal to 2 h, a paired t-test (two-tailed) was used to analyze the significance between the exposed and nonexposed ears for the average AC and BC threshold and the AC and BC threshold at individual frequencies. The confidence limit of the test was fixed at 95%, and P < 0.05 was considered statistically significant. PTA was performed bilaterally for both AC and BC threshold. AC threshold was evaluated at frequencies 250 Hz, 500 Hz, 1000 Hz, 2000 Hz, 4000 Hz, and 8000 Hz and 12,000 Hz. BC threshold was assessed at 500 Hz, 1000 Hz, 2000 Hz, and 4000 Hz. BC threshold at 250 Hz was not taken into consideration due to the possibility of vibrotactile responses. The audiologist was blinded while doing the audiometry and was unaware of the exposed and the nonexposed ear. The students undergoing the audiometry were unaware of the exposed and nonexposed ears. A calibrated Grason-Stadler 61 pure tone audiometer was used for PTA and Impedance audiometry was carried out using Interacoustic AT325 Impedance Audiometer. A total of 100 students were screened randomly. All the participants used Global System for Mobile Communication (GSM) network for mobile communication, and all of them were using smartphones of different manufacturers. The specific absorption rate of the handset ranged from 0.27 to 1.28 W/Kg for the head region for a different model of handset. Eighteen students were excluded on the basis of the exclusion criteria. The study population was finally limited to 82 students (males 29, females 53). Out of the total 82 students, 61 students (74.4%) were right handed and used their right ear predominantly, while 21 students (25.6%) used their left ear predominantly for making or receiving calls. Forty-two students (51%) used mobile phones for more than or equal to 2 h whereas 40 students (49%) used mobile phones for < 2 h. The final analysis of data was done among the 42 students who used mobile phones for more than or equal to 2 h/day. The average PTA threshold for AC and BC between exposed ear was higher than the nonexposed ear and the difference was significant (P < 0.05) [Table 1] and [Table 2]. 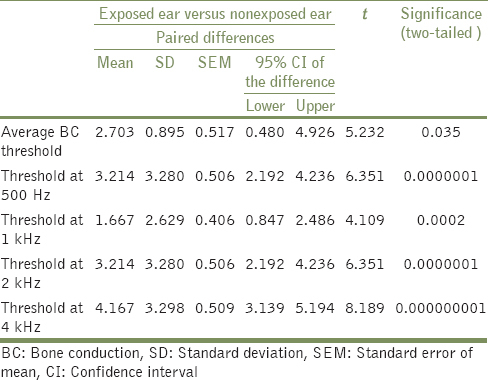 Analysis of AC and BC threshold at individual frequencies also revealed a statistically significant difference between the exposed and the nonexposed ear with a higher threshold in the exposed ear [Table 1], [Table 2] and [Figure 1], [Figure 2]. There was no statistically significant difference in threshold for AC at 250 Hz between the exposed and nonexposed ears. There has been a substantial concern worldwide regarding the effect of long-term exposure to EMR. Various studies have been undertaken to investigate the damage caused to the inner ear by the EMR from mobile phones. A study by Ramya et al. demonstrated a significant increase in hearing threshold with an increase in duration of use of mobile phones. Oktay and Dasdag found no difference in the threshold of hearing among users who used mobiles for 10–20 min/day but found higher threshold in users who talked over mobile phones for more than 2 h/day. Khullar et al. found a significant increase in auditory brainstem response threshold in people using GSM mobile phones for more than 30 min/day for the past 10 years. In the present study, a significant difference of PTA threshold for AC was found between the exposed and the nonexposed ears. The average PTA thresholds of the exposed ears were higher compared to the nonexposed ear (P < 0.05). 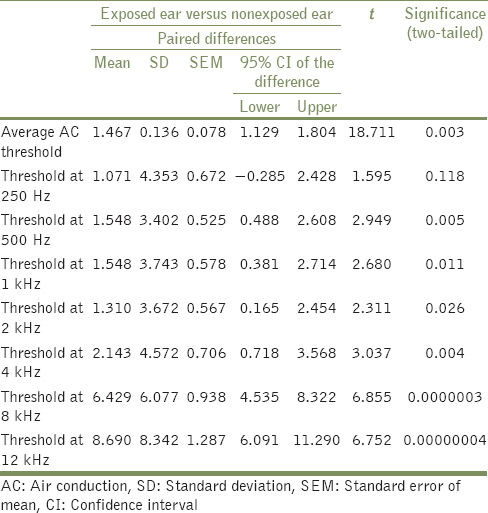 There is also a significant difference of AC thresholds between the exposed and nonexposed ears at frequencies of 2 kHz, 4 kHz, 8 kHz, and 12 kHz (P < 0.05) [Table 1]. The BC threshold of the exposed ear and nonexposed ear show statistically significant difference at the average threshold and threshold of all frequencies. These findings are similar to studies conducted by Ramya et al., Prajapati et al., Velayutham et al., and Panda et al. and suggest a possible inner ear damage caused by prolonged usage of mobile phones. All the students in this study used GSM phones and any comparison with code division multiple access (CDMA) phones could not be done. Panda et al. in their study found the damage to the inner ear to be same for both GSM and CDMA users. The same study found a higher speech frequency threshold and absent distortion product otoacoustic emission among prolonged mobile phone users and concluded that extensive use of mobile phones caused damage to both cochlea and the auditory cortex. There is an elevated risk of developing tinnitus after use of mobile phones for more than 4 years. However, in the present study, none of the participants complained of tinnitus. There is a report of mobile phone induced sensorineural hearing loss which reversed to normal on discontinuation of the exposure. It is possible that prolonged exposure to EMR may cause an increase in the audiological threshold as seen in this study. It is important to consider that in the present scenario exposure to mobile phones are rarely short. A study conducted among adolescents reveal that average duration of use of mobile phones is about 199.8 ± 127.4 min/day. Ramya et al. found a significant increase in the hearing threshold among those using mobile phones for more than 30 min/day for more than 5 years. The data from the present study also point toward raised threshold of hearing among prolonged users of mobile phones. Mobile phones have become an integral part of modern day functioning. As the global market of cell phones rise every year, people are exposed to cell phone use from an early age. At present, there is no data on the effects of radiofrequency on children and those with compromised auditory function. The effect of EMR on auditory function is a controversial issue, and its long-term outcome on hearing status is yet to be revealed. The present study shows an increase in the hearing threshold of the ear exposed to the prolonged use of mobile phones. It is not known whether this threshold shift is temporary or permanent. Scientific data are lacking on the molecular and biochemical alterations caused by the EMRs in the organ of Corti. Definite conclusions on the effect of mobile phones on the auditory function can only be derived from studying the ultrastructure of the cochlea and the hair cell after prolonged exposure to the mobile phones. As such this area provides an interesting avenue for further research. We would like to thank the STS Programme of Indian Council of Medical Research under which the research was carried out. We would also like to thank Dr. J. Mahanta for his valuable suggestions on statistical analysis of the study. We acknowledge the help and support of Ms. Kinga Choden Chewang who meticulously performed the audiological tests in this study. World Health Organization. Electromagnetic Fields and Public Health: Mobile Phones; 2014. Available from: http://www.who.int/mediacentre/factsheets/fs193/en/. [Last cited on 2016 Jan 26]. India to Have 651 Million Smartphones, 18.7 Million Tablets by 2019. The Economic Times; 2015. Available from: http://www.articles.economictimes.indiatimes.com/2015-02-03/news/58751662_1_networking-index-mobile-users-population. [Last cited on 2016 Jan 01]. Stefanics G, Kellényi L, Molnár F, Kubinyi G, Thuróczy G, Hernádi I. Short GSM mobile phone exposure does not alter human auditory brainstem response. BMC Public Health 2007;7:325. Schoemaker MJ, Swerdlow AJ, Ahlbom A, Auvinen A, Blaasaas KG, Cardis E, et al. Mobile phone use and risk of acoustic neuroma: Results of the interphone case-control study in five North European countries. Br J Cancer 2005;93:842-8. Uloziene I, Uloza V, Gradauskiene E, Saferis V. Assessment of potential effects of the electromagnetic fields of mobile phones on hearing. BMC Public Health 2005;5:39. Ana GR, Ukhun AE, Shendell DG, Osisanya PA. Acute, repeated exposure to mobile phone noise and audiometric status of young adult users in a university community. ISRN Public Health 2012. Article ID 241967, 7 pages. doi:10.5402/2012/241967. Meric F, Dasdag S, Dasdag M. Does radiofrequency exposure affect hearing of children? Int Adv Otol 2009;5:356-60. Oktay MF, Dasdag S, Akdere M, Cureoglu S, Cebe M, Yazicioglu M, et al. Occupational safety: Effects of workplace radiofrequencies on hearing function. Arch Med Res 2004;35:517-21. Ahn H, Wijaya ME, Esmero BC. A systemic smartphone usage pattern analysis: Focussing on smartphone addiction issue. Int J Multimed Ubiquitous Eng 2014;9:9-14. American Speech-Language-Hearing Association. Guidelines for Manual Pure-Tone Threshold Audiometry; 2005. Available from: http://www.asha.org/policy/GL2005-00014.htm. [Last cited on 2016 May 31]. Ramya CS, Karthiyanee K, Vinutha S. Effect of mobile phone usage on hearing threshold: A pilot study. Indian J Otol 2011;17:159-61. Oktay MF, Dasdag S. Effects of intensive and moderate cellular phone use on hearing function. Electromagn Biol Med 2006;25:13-21. Khullar S, Sood A, Sood S. Auditory brainstem responses and EMFs generated by mobile phones. Indian J Otolaryngol Head Neck Surg 2013;65 Suppl 3:645-9. Prajapati V, Makvana JB, Gami G, Thakor N. Effect of chronic use of mobile phone on hearing of young adult age group: A case control study. Int J Res Med Sci 2015;3:2664-8. Velayutham P, Govindasamy GK, Raman R, Prepageran N, Ng KH. High-frequency hearing loss among mobile phone users. Indian J Otolaryngol Head Neck Surg 2014;66 Suppl 1:169-72. Panda NK, Jain R, Bakshi J, Munjal S. Audiologic disturbances in long-term mobile phone users. J Otolaryngol Head Neck Surg 2010;39:5-11. Panda NK, Modi R, Munjal S, Virk RS. Auditory changes in mobile users: Is evidence forthcoming? Otolaryngol Head Neck Surg 2011;144:581-5. Hutter HP, Moshammer H, Wallner P, Cartellieri M, Denk-Linnert DM, Katzinger M, et al. Tinnitus and mobile phone use. Occup Environ Med 2010;67:804-8. Al-Dousary SH. Mobile phone induced sensorineural hearing loss. Saudi Med J 2007;28:1283-6. Bhatia MS, Sharma V, Chabra V. Neuropsychiatric effects of mobile phones. Delhi Psychiatry J 2008;11:52-8. Balbani AP, Montovani JC. Mobile phones: Influence on auditory and vestibular systems. Braz J Otorhinolaryngol 2008;74:125-31. Arai N, Enomoto H, Okabe S, Yuasa K, Kamimura Y, Ugawa Y. Thirty minutes mobile phone use has no short-term adverse effects on central auditory pathways. Clin Neurophysiol 2003;114:1390-4. Parazzini M, Brazzale AR, Paglialonga A, Tognola G, Collet L, Moulin A, et al. Effects of GSM cellular phones on human hearing: The European project “GUARD”. Radiat Res 2007;168:608-13. Nikhita CS, Jadhav PR, Ajinkya SA. Prevalence of mobile phone dependence in secondary school adolescents. J Clin Diagn Res 2015;9:VC06-9.